How did the camping movement get started in the Indiana-Michigan Conference? Why have a conference camp? These are legitimate questions and ones that I will attempt to answer. From my limited research I have gleaned the following information. It is interesting to note that no thought was given to provide a camp experience for our own children. The thinking at that time was to provide for deprived and welfare children. We must also note that Paul Bender played a significant role in the camping movement. He suggested a summer camp for children. It was he who suggested that IN-MI Conference have a member on the Youth Village Board, and finally Paul asked for stated objectives for Youth Village. Here then we have the setting for the camping program in our conference. Although Youth Village was a part of the General Mission board most of the children for camp came from mission churches within the IN-MI Conference. The program started the summer of 1950 and continued as Youth Village until 1983 when it became a part of the Amigo program. During those years Youth Village provided a camping experience for thousands of children. At one time as many as 26 different mission churches sent children to camp. Children came from Youngstown, OH; Saginaw, MI; Indianapolis, IN and Peoria, IL. laws by the state of Michigan and staffing. A report of this kind would not be complete without mentioning the impact that the Bible Memory Program had on the whole camping movement. 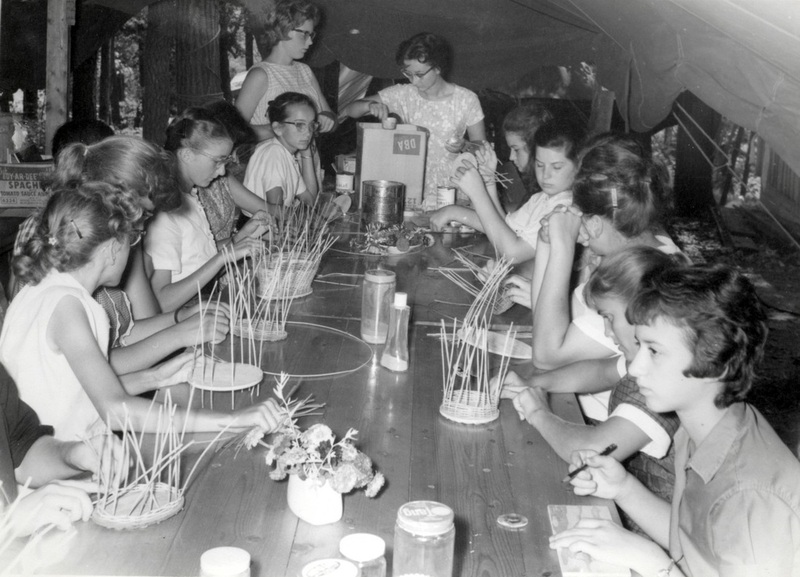 One component of the Bible Memory Program was a week at camp. Many of the IN-MI Conference churches were involved in this program. As it grew, so did the number of campers. Finding facilities for the campers was becoming a real problem. Youth Village was no longer large enough and other camping facilities were not readily available. The time seemed right to consider a conference camp. Twenty-three interested persons under the leadership of the Christian Workers Conference Executive Committee investigated lake property near Howe, IN, on June 27, 1956, and discussed the possibilities of a conference camp. Another location was later investigated north of Camp Friedenswald. However, when the 360 acre Perrin Lake area, including approximately 80 acres in lake, became available in September, it seemed the most logical location to the Christian Workers Conference Executive Committee which had been authorized at the August meeting of conference to proceed with the development of a camping program. 1. To provide camp facilities under church sponsorship and direction for congregations, families, youth groups and children. 2. To provide suitable facilities for Bible conference, mission meetings, inspirational services, and such other meetings as the Board of Directors may approve. 3. To provide a suitable location for family cottages or dwellings for rest and/or recreation in a Christian environment. Approval for the purchase of the Perrin Lakes property was given at a November 6 meeting of ministers and persons interested in camping called by the Christian Workers Conference Executive Committee. The purchase was then completed early in 1957. Funds for the purchase were to come from three sources: the sale of lots along the north shore of big Perrin Lake, the purchase of Association memberships at $100 each, and contributions from congregations throughout the conference. The Association would then manage the camping program for the conference. The first year was spent in gaining control of the property and preparing it for the sale of lots, putting in necessary roads, planning for the use of the lakes, cleaning up the camping area and publicizing the program among the churches. Roman Gingerich, from Goshen College and Bob Tulley, from Indiana University drove the stakes where the cabins and restrooms were to be located in both boys’ and girls’ area. An interesting sideline was the unsuccessful attempt of a local sportsman’s group to gain control of the property for public use. At their October 18, 1958 meeting, the Board of Directors agreed to provide facilities for the 1959 Bible Memory camps. On December 6, Kenneth Snyder was appointed camp manager for one year on a marginal time basis throughout the school year and full-time during the summer. Beginning on March 28, 1959, a number of work days were scheduled so that individuals and congregations could assist with the cutting of trees for lumber and later in the summer the construction of the camp buildings. Four thousand pine seedlings were planted on the hills west of the camping area and along Banker Street Road in the spring of 1959 and another 4000 in the spring of 1960. After they matured sufficiently MYF groups harvested them for Christmas trees. More than $1800 was realized from these trees. The camping program grew slowly over the next several years. Some of the significant events during that time included: the name Camp Amigo was chosen, boys and girls camps were introduced, Torchbearer Rallies, MYF annual meetings and Bible Memory camps were held. On November 15, 1965, the Board of Directors agreed to ask John R. Smucker to serve as camp manager beginning January 1, 1966. John accepted the assignment and two years later became executive director. During John’s tenure, the mortgage on the property was paid off, the Yutzy house was purchased for the director and the all-purpose building (the lodge) was dedicated on May 30, 1967. The new facility made it possible to add additional programs such as: youth snow camps, business men’s retreat and farmer’s day – just to mention a few. Because Amigo was now expanding its program it was necessary to reduce the Bible Memory usage. During the summer of 1968, Bible Memory was scheduled for three weeks instead of four. In addition to program changes new facilities were added. These included a new maintenance building, the tube run and a RV Park known as Amigo Park. This park was dedicated on July 8, 1972. The park has a bathhouse, water and electrical hookups for 30 plus units. Tent sites are also available. A final happening before John left was the establishment of the Outdoor Education Program in the spring of 1971. Title money from the government was available, so 60 fifth grade students from York Elementary School along with their principal, W. Dale Stutzman, and teacher, Dan Hochstetler, had their first outdoor education experience. Since that time the program has grown to include many schools and thousands of students. With winterized cabins the program continues later in the fall and starts earlier in the spring. Also during the summer of 1959, a house was built for the camp manager along Banker Street Road at the northwest shore of Perrin Lake. This house later became the home of the custodian, which designation was changed by the Board of Directors in 1968 to camp manager designation was changed to executive director. Other important developments during those years included a change in custodians – Mr. and Mrs. James Carpenter for Mr. and Mrs. Samuel Troyer. There was also an agreement to join Bethany Christian High School in a joint building fund drive in the conference, as well as the planning and construction of the administration building and camp store. John R. Smucker left in the fall of 1973 and was replaced by Rich and Chris Oswald. This year also was the arrival of John and Evelyn Blucker as Amigo Park custodians. Children’s play equipment was added to the park during this year. During Rich Oswald’s years at camp, additional programs and facilities were added. The health center was built, director’s house was constructed, boat house built, garage for Amigo Park managers built and a new swimming area dredged. As it turned out, the dredged area was not suitable for swimming but was an excellent place for launching boats and fishing. During the year 1977-1978, four V.S. people arrived at Amigo. Some dramatic changes took place during this year. The V.S. people were Dale & Ethel Stutzman, Bill Minter and Karen Albrecht. Ethel became the first full-time secretary, Karen was the full-time cook and Bill and Dale built trails, managed the woodlot, plowed snow and constructed the first marsh bridge. The cross-country ski program got off to a good start during the snowy winter. A new furnace was installed in the “Lodge” so much wood had to be cut and split. The year of 1979 brought some more changes. An arts and crafts building was constructed and in later years was remodeled and is now the nature center. Also during this time, Lakeside cottage was purchased. It too has been remodeled and is now used for full-time staff. The term full-time staff started being used when Rich Oswald was camp director. In 1982, Rich and Chris decided it was time to move on. LeRoy Mast, a board member, was his replacement. With LeRoy’s and Sherry’s arrival, John Blucker’s moved from Amigo Park to full-time maintenance position, Mary Lou Farmer became full-time secretary and Edna Bontrager was the cook. The other positions were filled with part-time or V.S. personnel. Having been a board member, LeRoy knew which direction the camp program was going. He continued to upgrade facilities and program. Most of the girls’ cabins were winterized. The offices were remodeled along with the staff lounge. A donated trailer was converted into a trading post. Camp Amigo’s logo was changed under LeRoy’s direction. He also proposed a very ambitious project known as 2001 and Beyond. Included in this proposal were a modern retreat center, activity building and swimming pool. Sherry was involved in the fundraising for this project. Before LeRoy and Sherry left Amigo in 1992, the modern motel type retreat center was a reality – a far cry from the tents and cabins of former years. LeRoy had been with Amigo as director for 10 years. His replacement was Dana Sommers, former director at Laurelville Mennonite Church Center. His coming ushered in a new era of camping at Amigo. The new facility allowed and required multi- programming, a totally new concept for the majority of the people working at Amigo. How could it possibly work to have several programs going at the same time? Where would people sleep? How would they eat? What about staff? What about activities? The whole concept seemed rather confusing. But with all the facilities now available, more programs could and should be offered. Usage is what allows things to happen. For Dana this was nothing new as he had experienced much of it at Laurelville. Since his arrival the dining hall has been remodeled so that the upper level is now all dining and kitchen area. This allows for serving large and small groups at the same time, and there is much more flexibility. The lower level is used for meetings. Another new facility is the Activities Center. The weather is no longer a major factor with scheduled activities. This building along with the West Shore Lodge and winterized boy’s cabins are all a part of the new look at Amigo. Because Amigo is no longer just a camp, the name was changed to Amigo Centre. Amigo now has multi-programming in place. This means several groups are using the facilities at the same time. Old programs such as Outdoor Education, summer camps and winter snow camps continue to be popular. New activities such as Elderhostels, Christmas at Amigo and Celebrate the Ministry have been added. The development of the Amigo program has grown over time from the early days of offering a few summer camp programs along side Bible Memory Camps to providing year-round programming and now to multiple group programming. People like Dale Stutzman, Cindy Graber, Mark Vincent, Brian Martin Burkholder and countless short-term program coordinators have created and nurtured meaningful programs that help to facilitate the ministry of the church. The Outdoor/Environmental Education program has been expanded to serve interested hosted groups and all program groups in addition to the traditional school program. The facilities have been expanded to meet the changing needs of program and of the clientele. One can only wonder at the possibilities for the future of Amigo Centre. But one thing is certain, the Amigo story is ongoing and ever changing and that is the way it should be. When we stop and reflect, we have to marvel at what all have happened at a place that we call Amigo. God has certainly answered the hundreds of prayers that have been prayed individually and collectively at this place. Think of all the lives that have been touched in one way or another by the Amigo experience. It is a significant ministry to the church and to the families of the church. I conclude with a quote from the JOURNAL OF CHRISTIAN CAMPING. “The future of camping depends on how well we manage the incredible resources entrusted to us by the vision of our camp founders. Before the soul goes out of Christian camping, let’s work to retain the plus dimensions of the natural beauty of our camps.” May we take this and other calls of faithfulness to heart and action. To God be the glory.